Get concrete feedback on your business decisions. Test market your tagline options quickly and privately with our unbiased audience. What is your opinion on the below vision for a company that makes baby products (e.g. stroller organizers, baby tents, baby rockers, etc.) that help parents? I like the first part up to the colon. To make life easier for parents is a great goal for a baby products company. Every parent of a baby needs life to be made easier, so a company that makes items with that in mind is a good one as far as I am concerned. I would expect their products to be useful and well designed. I think "focus on what matters" is where it should end. I don't like the second part of the line telling me that making memories with my little ones is what matters the most to me. It actually wasn't. Keeping my child clean, fed, clothed, and comforted was most important. Having time for self-care mattered a lot too. I think what matters most is going to be different for different parents and you don't want to state your mission too narrowly. I would say "so that they can focus on what matters most" and leave it at that. Nice! It's succinct and to the point, yet comes across as sincere and caring. I think the company sounds like they have kids of their own and know the importance of things like spending time on what matters-- creating happy memories, rather than worrying about the products they have to buy for their kids. It comes across that the company is genuine and sincere and going to go out of their way to make sure products are safe and well designed so that parents don't have to. Imagine for a second you love to read parody and satire. You visit a website that's devoted to parodying the "success/self-help/motivation/home-based-business/MLM/e-book/etc." industry - What's a catchy name for said website? Underwear Millionaire is the name that came to mind for me. I consider it to be fitting as it is related to the context and to be is a bit catchy due to it being simple and easy to remember, it also rhymes adding to the value of it as a catchy name. In terms of whether such a site would be useful or not, I think that is possible it could be. The industry would not exist if there were not people who were willing to try get rich quick schemes. Making fun of the MLM company "Herballife Nutritian" call it "Arbor Vitae Business Journal" sort of inspirational and uplifting but also a bit too much and borderline confusing. I really like the idea of a site like this though. Or playing off the fancy latin word usage call it "Lux Inspirna"
If I were to give a title I'd choose " Don't judge me, I am not a book" It's catchy that's one point, and I just thought that having a name of a website that seems pretty ironic to what its content is makes it more enticing for people to check it. HelpMe which is probably taken, so some available variation thereof. Sort of a play on the self help/self employed idea, but also a sort of "this crap(MLM/unhelpful self promoted ebooks,etc) is so bad please (HelpMe) and save me from it. Which Brand name relates better to an Exercise Recovery Equipment Brand ? I like LifePro much better because the title implies that you are trying to be a pro at life which is what you are trying to do by using the recovery equipment. Soarfx sounds like something that would apply to flying not a piece of recovery equipment. I think this name would work for a broad spectrum of products, so it might be a good choice in case it is later decided to branch out and sell more than just exercise related products. "soarfx" makes me think of soaring in the air vs sore like from working out. Without the question being specific, i would've never assumed it's for a recovery from exercise. I like how the brand name lifepro sounds. It sounds like something you want to use for the rest of your life to be honest. It is a guaranteed to buy because of the name. I like B because you can actually read the brand easily and it makes sense. With A, I found myself asking how I should even pronounce it. SoarFx is too vague, it makes me think of aviation or something. LifePro seems more appropriate because it includes the word "life." This one reminds me of the term Rx which is for a medicine. So SoarFx reminds me of something I need if I am sore and need recovery. I think this one is clever because it sounds like you need to fix what is "sore" so that you can "soar" or preform better. I like that the name "PawRamp" doesn't specifically bring any breed of dog to mind. I just think of dogs in general when I see the word "Paw". Option B's "RoversRamp" makes me think of a male dog and a dog of a larger breed. I have a small female Shorkie, so this makes me imagine that Brand B would be too large and cumbersome for her to maneuver. I like PawRamp much better than RoversRamp because when I think of a rover I don't of every kind of dog. When I think of a rover I think of a leaner faster bigger dog. PawRamp makes me think of all dogs and the fact that dogs paw you when they want you to do something for them like put them up on the bed. Option B makes it sound more like it is made for dogs, which the company wants to sell for. Option A sounds like it could be for any animal with paws, so it doesn't specify that it is made for dogs. If I were the company, I would want it to be clear that what I was selling is what the customer wants. PawRamp sounds cuter and in some ways more loving. This name is telling me that this product will be for my pet's little toes and I like that. I would click on this name instead of the other name, 'rover' to me denotes an old style to call my doggie. I chose option A first, as I like the clear association of the name (specifically "bark) of the product with its use and function. It clearly implies that the ramp is aimed at dogs. I chose Option D second because there is still a strong correlation between name and target user. I didn't like this so much as Option A because while option a showcases a general animal-action relationship, Option D implies a specific animal-name relationship. As Rover is probably a commonly-identified dog name, it works, but I found it somewhat exclusionary. I chose option B only because it wasn't as bad as the remaining option, option C. I strongly dislike intentionally-misspelled words. RoversRamp has alliteration, which makes it memorable. Rover also means one who wanders, signifying freedom of movement for the dog. PawRamp is a far second place, it is inoffensive and brings to mind ease of use for the dog. EzyRamp gets points for sounding easy to use, but loses points because it sounds kind of cheap. BarkRamp doesn't get a place because Bark is more of a negative term and not one you want associated with the product. Option D basically says it is a dog's ramp (Rover being used exclusively for Dogs for years). So it was a good indication that it was a dog ramp.Option C - who doesn't like Easy! Name says it all.I liked Option B more than A - I don't want any ramp that would cause a dog to bark more than is needed. I can't stand yappers - so I chose B. Which name for a skincare company do you like better: Dermashine or Brillare? We will be offering beauty equipment like light therapy devices, derma rollers and products like anti-aging serums, creams, etc. I genuinely love that the name of B is a word in Italian. It gives it a nice foreign appeal to something basic. That's a great marketing stance and Shine/Brillare is an appealing name for a company. Dermashine is bland in comparison. It lets you know it has to do with skin but it's just so basic, where Brillare has depth and interest tied to it. The word derma immediately shines through for me because it is related to the skin. So i would probably know what this product was without having to do too much research. The other is a little vague and would require more thinking. It also seems award where as Dermashine flows better. This one is easier to pronounce and you can sort of tell from the name what it is, where you will have to keep telling people over and over what the other one means in Italian. I think that you have to make it more obvious to grab the attention of those you want to buy the product. I think it's pretty, Derma is easily identifiable as a skin related thing for most English speaking folks, Americans at least, but Brill is most commonly "Brillo" in the US. It makes me think that option B would be coarse or uncomfortable, akin to using Brillo on your skin. I like Brillare because not only does the word sound elegant but captures the essence of what kind of equipments are available from the company. I understand option A also has the word shine in it and although it is a good choice as well, the name just sounds better than A. For a new natural skin care line, which brand name attracts your attention the most? The words Luna Alura are intriguing. Most people kinda of know that Luna means moon and it is not hard to decipher Alura means allure. If this was for some type of skin product I would definitely pick Choice B. Who doesn't want to have the allure of the moon. The font type is pretty and the longer green line under the words is more eye catching. Option B sounds like my skin would be clearer, brighter, and more natural. Luna as in my face and skin would glow as the moon. Alura as in my skin would be so alluring and attractive that everyone would wonder what I was using and where I got it. I like the balance of the words on top of each other. Natural to me means simple and it is a more simple design. The balance is just better than the longer first portion of the name in option B. The two capital letters throw the balance off. Luna Alura sounds like something that could sell interesting skin care that I would use; Astra sounds like it might be related to astrology or "energy fields" or other woo things that would make me suspicious of the company. The name Luna means the moon which reminds me of moonlight and Alura makes me think of the word alluring. Putting the two together as alluring moonlight is very appealing to me. It sounds natural and glowing. Option B has a more comprehensible connotation, I believe. Whereas Alpaca Approved comes off as a bit confusing, Alpaca Outpost signifies first and foremost that it is an "outpost," a one-stop shop for Alpaca based gear, but additionally, it lends the brand a bit of out-doorsy credential. Option A sounds more caring, as if the Alpaca have given their permission and have been treated respectfully. Option B gives me the impression of an old western movie where the trappers would go to sell their furs just for money, mass murder if you will. I really think choice B is much better. It sounds smoother, and sounds like a great store name. I think that would be much better and really stand out in comparison to choice A. Alpaca Outpost would be a great site name for selling alpaca-related goods. Which headline for a home cooking-related service would make you want to learn more? Why? I liked the idea that B presented, of making cooking fun again! Rad is a positive word but nothing something I typically use or say and it's not as clear to me what that means - does that mean more delicious? more interesting? The copy on choice B is very clear what Sharpness is delivering. Otherwisee, it looks like the two options are very similar. I will note that on both choices that I thought this was a cooking video / content site, not a knife site - that might be something to enhance as right now it's only clear from the top black bar and the tiny copy. At first blush, the term "Rad" feels slightly condescending. That said, I feel myself drawn to it despite myself. Option B is something I will forget as soon as I see it, it simply doesn't keep my attention and slips from the brain much to easily. Option A is something I will remember, even if it is not entirely in a positive way. Still, the more time spent dwelling on an image the more likely a person is to click it to seek more information. I like the headline "Cooking's Fun Again" because many people do like cooking but will get bored of the same recipes. A home cooking-related service that can invigorate someone's love for cooking again would be great and making it "fun" rather than just "rad" sounds better. Which name do you like for a natural skin care brand? I think "Derma Rejuve" sounds the least natural. "Astra" sounds very feminine and pretty. It sounds like a woman's name, possibly with very long hair. "Bare Botanix" sounds very natural. I think that's the name that sounds the most like the company really focuses on being natural or organic. With "Derma Rejuve" I kind of think more about doctor's offices or plastic surgery. Derma Rejuve just sounds the best. Skin Rejuvenation, nice and friendly sounding. Also sort of says exactly what it is going to do. Bare Botanix while I like the name could get someone thinking this has to do with the brand Bare Minerals, don't want to risk trouble there. Astra Naturals, I do not see how Astra equates to skin? I mean it could be it does, but not a common term. I like option A the most because it actually sounds very natural and rolls off of the tongue nicely. Option B would be my second choice because it sounds like it would make my skin feel fresh. Option C is my third choice because I had to choose a third, but I don't really like the name much at all to be honest; I don't feel like option C fits your product well as a name. Astra Naturals sounds futuristic and interesting but still natural, from the earth. It is very interesting. It is fun to say Astra. Derma Rejuve is fine but it sounds like a million other beauty brands, its not very original. Bare Botanix sounds weird to me, the bare mixed with botanix makes me uncomfortable. Also it makes me think of botox which I don't like. Send an email to your friends and family with the different tagline options and ask for their feedback. Create a Google Ad or Facebook Ad for all the different tagline options and see which one has the highest click-through rate (CTR). PickFu gets you the same quantitative and unbiased results as buying expensive ads, but much faster and without any of the hassle of trying to figure out how to setup the ads. As a bonus, you get written qualitative feedback you can use to further iterate on your tagline options. Armed with this data, you will have the confidence to choose the best tagline option. Start optimizing your business with audience-driven data today. 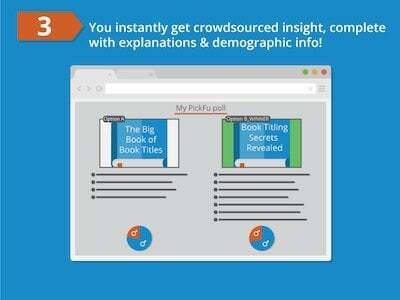 Why use PickFu to test your tagline? 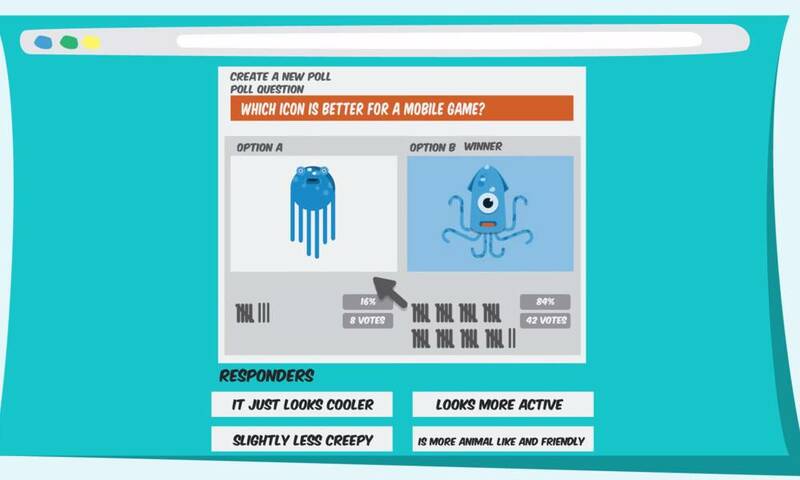 Just write one question and two answer options and your tagline option poll is ready to go. Our respondents match US demographics, so you get balanced, unbiased results for your tagline option. Keep iterating on your tagline option throughout the day as you instantly get feedback you can use. Get an objective third-party point-of-view on your tagline option. Learn the why behind each response and make better tagline option decisions going forward. PickFu is great because it allows you to get data outside of the current echo chamber you've created with your customers, communities, and true fans. It's a great way to test market messages, tag lines, and product names outside of your first-degree network. PickFu is now an essential part of every major marketing and product development initiative for us. One of the most important aspects of business I've learned is to assess rather than guess. 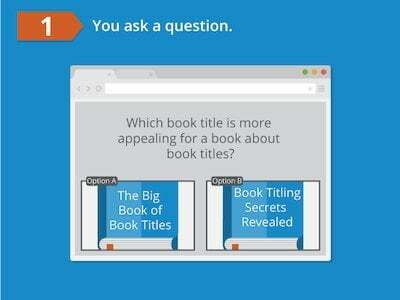 This is crucial when it comes to finding the perfect book title and cover. 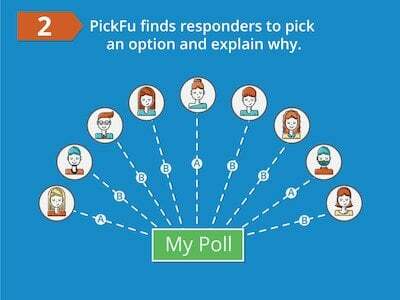 PickFu has become my go-to resource to conduct surveys because of their speed, demographic breakdown, and helpful comments provider by the respondents. I recommend PickFu to all of my self-publishing clients as an essential part of the research process. Your service is absolutely amazing. A true blessing to entrepreneurs. How time and money and hard effort saving! Brilliant idea! Join the thousands of entrepreneurs using PickFu to optimize their businesses. Don't take our word for it — read their reviews of our business testing software or browse some real business polls. Learn how customers use PickFu for idea validation.